Calgary, AB – September 20, 2017 – Benevity, the market leader in workplace giving, volunteering and community investment software, announced today the release of new data showing a significant shift in charitable donation trends in 2016 and 2017. 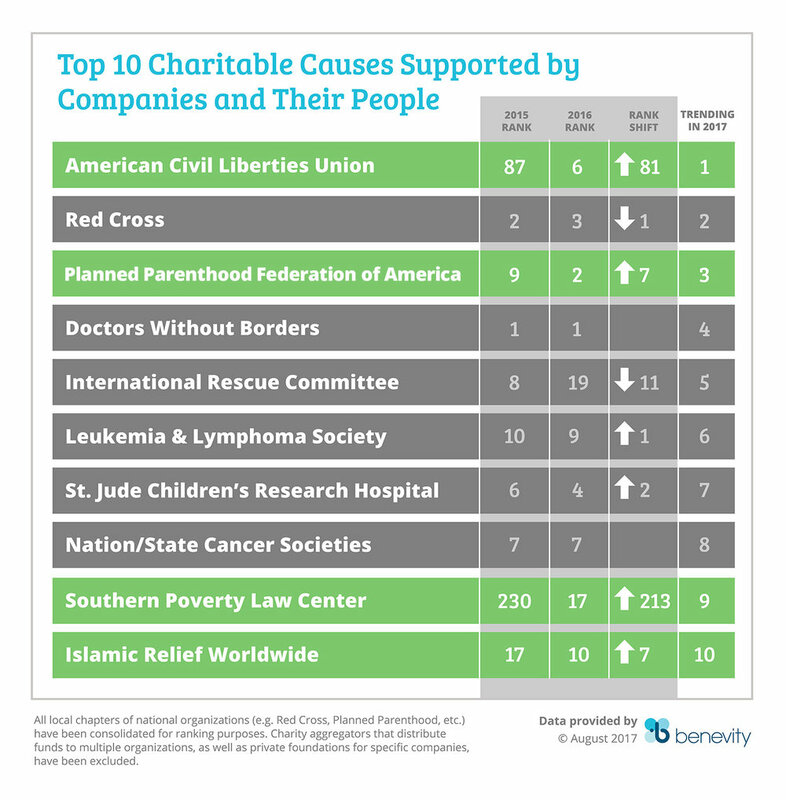 Benevity compiled the data from their work with nearly 300 global companies representing more than $1 billion in donations to more than 100,000 charities worldwide. The data shows a marked shift in employee and company giving trends, with human rights organizations taking top slots from long-standing leaders. Additionally, the data points to new trends with workers immediately responding to newsworthy events with the support of their employers who are making event-triggered giving and volunteering easier through consumer-grade enterprise “Goodness” technology, like Benevity’s. Corporate giving trends are now influenced by current events. For example, following the Charlottesville White Supremacist March in August, donations to Southern Law Poverty Center spiked to 29 times year over year growth. Likely sparked by the current socio-political climate and by long-brewing changes in the way companies and their people look at giving back, the data points to a growing notion that today’s corporate giving landscape is at a tipping point. No longer merely about seeking a tax deduction or requiring dutiful participation in a company’s annual fundraising campaign, corporate “Goodness” is increasingly about companies allowing – and often helping - their people to take the lead on social impact initiatives and support the causes that matter to them personally. While the U.S. Presidential election was a major catalyst for this shift, other notable trends -- such as greater expectations for corporations to be agents of social change, the availability of consumer-grade, experiential technologies that make it easier for companies to empower their people to be pro-social at work on a global scale, and a shifting workforce that sees more Millennials at work -- are all contributing as well. Benevity Inc. is the global leader in online workplace giving, matching, volunteering and community investment software. Many of the world’s most iconic brands rely on Spark, Benevity’s award-winning cloud solution, to power corporate “Goodness Programs” that attract, retain and engage today’s diverse workforce by connecting people to the causes that matter to them. With software that is available in 16 languages, to several million users around the world, Benevity has processed over a billion dollars in donations to more than 100,000 charities worldwide.